Existing-home sales are up considerably compared to a year ago despite the share of first-time buyers only modestly improving. The reason is that the boost in sales is mostly coming from pent-up sellers realizing their equity gains from recent years. Competition for existing houses on the market remained stiff last month, as low inventories in many markets reduced choices and pushed prices above some buyers' comfort level. The demand is there for more sales, but the determining factor will be whether or not some of these buyers decide to hold off even longer until supply improves and price growth slows. The Case-Shiller home price index still shows double inflation annual price gains with regions still simply exploding in price. Probably the worst of this report is the prediction home prices will blow out at the bubble year gain levels. This is while first time home buyers are squeezed out, with tight standards and 20% down payments required. 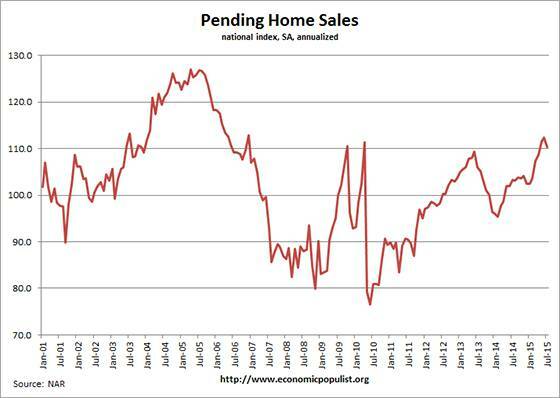 May was a nine year pending home sales high and the NAR believes it is a matter of inventories causing June's decline, yet the NAR and their economists are always warm fuzzy pie in the sky in their analysis. Others are pointing to housing data leveling off.